For most cyclists, a helmet is an essential bit of kit that you wouldn’t leave the house without. If the worst happens and you’re involved in an accident, you wear a helmet in the hope that during that crash your helmet will provide extra protection and limit your risk of serious head injury, right? That got Specialized thinking – what if your helmet didn’t just protect you during a crash, but before and after too? Already some of the most popular, top-performing, and best-looking helmets around, Specialized have added MIPS and their all new ANGi (Angular and G-Force Indicator) sensor to their updated helmet range to turn the modern bicycle helmet into a live tracking device, crash detector and safety beacon that connects you to help when you need it most. Let’s start with ANGi – or Angular and G-Force Indicator, to give it its full name – an innovative sensor which mounts at the rear of the helmet. This unassuming little black box is chock full of tech, with a built-in accelerometer and gyroscope that measures the forces transmitted to your helmet during an impact, and the rotational forces that occur during crashes even when there is no actual impact but can cause huge damage to you, the rider. Currently, ANGi is alone in offering this combination of impact and rotational force detection and automated notification, and differs from other crash detection systems like you might find on your Garmin by specifically measuring forces on the head rather than the bike, to get riders help when they most need it. 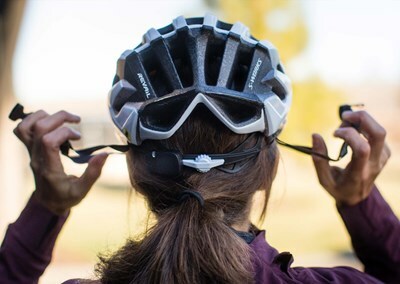 The system works by hooking up to the Specialized Ride App on your smartphone via low-energy Bluetooth, and then monitoring any forces on the helmet throughout your ride. If the ANGi sensor detects any forces usually associated with a crash it will send an alert to the Ride App on your phone, sound an alarm and trigger a countdown timer – if you’re ok, you can just cancel the countdown and carry on riding; but if you have been involved in an accident and you can’t cancel the countdown, the Ride App will send an alert to your emergency contacts telling them that you may have been in a crash. Plus, it’ll also send your location via GPS coordinates to all of the contacts you choose to add in the Ride App. If your worried about the alert going off when you’re not injured, you can also extend the length of the countdown from the Ride App, should you be fumbling for your phone in a back pocket. For extra peace of mind for you and your loved ones, you can also choose to provide your contacts with a live tracking link so that they can follow your ride in real-time. But what if you’re out exploring and your signal drops out? ANGi can still monitor your safety, albeit in a slightly different way – providing you’ve got a signal at the start of your ride you can set an estimated ride time before you head out. If you haven’t returned from your ride within that time frame, ANGi will notify your contacts with your last uploaded location, whether you have phone signal or not. The brains behind ANGi, the Specialized Ride App, is borne out of numerous studies which highlighted the top two reasons that people don’t ride bikes – they don’t know where to ride or where to get started; and they’re concerned about their personal safety. The app itself can find local rides to join as well as recording your ride and performance data, but it also acts as the communication platform which powers ANGi’s ability to alert your contacts if you’re involved in a crash. You get a year’s subscription to the Ride App thrown in for free when you buy your ANGi-equipped helmet which allows you to connect as many helmets as you like. After that first year, there’s an annual cost of $29.99. The new ANGi sensor will come equipped on several Specialized helmets across their range, including the Evade II, Prevail II and Propero on the road, Ambush and Dissident for mountain bike, and even on the kids Shuffle. The remainder of the range are ANGi-ready, with a specially-designed mount which allows you to attach an aftermarket ANGi sensor. The sensor itself is waterproof rated at IPx7, uses a standard CR2032 battery, and is covered by a two-year warranty. So ANGi can get you help should you need if you crash, but what about protection in the crash itself? MIPS has been around for a few years, and Specialized have now decided to get behind the technology ad include it across their helmet range. MIPS, standing for Multidirectional Impact Protection System, adds an extra layer of protection to your bike helmet via a low-friction inner liner within the helmet that slows the helmet’s foam liner to rotate independently by between 10-15mm during an angled impact. This movement is designed to counteract the rotational forces which can occur when your head is struck at an angle or when it rotates quickly and comes to a sudden stop, and can cause the brain to twist within the skull and become injured. MIPS comes in various forms, and Specialized have used the different styles of MIPS protection in different helmets across the range – the Centro, Align, Shuffle and Mio use MIPS B-Series; the Airnet, Ambush Comp, Chammonix, Echelon, Tactic 3 and Propero 3 use MIPS C-Series; and the S-Works Dissident uses MIPS E-Series – but it’s the top models in the range which get extra special treatment. Exclusive to Specialized is the new MIPS SL, an ultra-light and supremely comfortable version of MIPS which essentially integrates the technology within the helmet padding itself. Using a minimalist ‘wristband’ attachment system, it provides the same 10 to 15 mm of rotation in every direction, with the same brain protection benefits as every other version of MIPS, but in a lighter, more comfortable package. Across the range, the Ambush, S-Works TT, S-Works Evade II and S-Works Prevail II get this new tech. The Specialized helmet range itself is unchanged, with all the existing helmets now available with MIPS and ANGI-ready – that means you get everything from the super-aero Evade II to the downhill Dissident with extra protection alongside the same comfort and performance you’ve come to expect from Specialized helmets. Shop our range of helmets at your nearest store, or shop the entire range online with free delivery and 90-day returns.